Lemon – ½ of one lemon. Soak rice in water for ½ an hour. In a pan, add ¼ cup of ghee. To this add vegetables (beans, carrots, cauliflower, potatoes, tomato, green peas, green chilies, and crushed ginger-garlic). Sauté it well and cook with the lid closed. To this add dry curry powder (turmeric, coriander, chili, garam masala), salt, curd, coriander leaves and mint leaves. Close the lid and cook for 5 minutes. Remove from flame. In a biriyani pot add some oil. Add cloves, cardamom, cinnamon, nutmeg, star anise, fennel seeds to it and sauté well. Add strained rice and again sauté for 5 minutes. Now add 4 cups of water and boil it. Now add salt, biriyani leaf and cook it with the lid closed. Add lemon juice to it before cooking rice. Water should completely reduce while cooking rice. Lower the flame. Remove ¾ of the cooked rice from it and spread vegetable mixture into it. Again, layer it with cooked rice and then with the vegetable mixture. Layer the vegetable masala and rice in the same way. After layering, garnish it with cashew nuts and raisins (roasted in ghee), sliced onions fried in oil, coriander leaves and mint leaves. Cook for another 5 minutes in low flame. Remove from the flame and mix the biriyani. 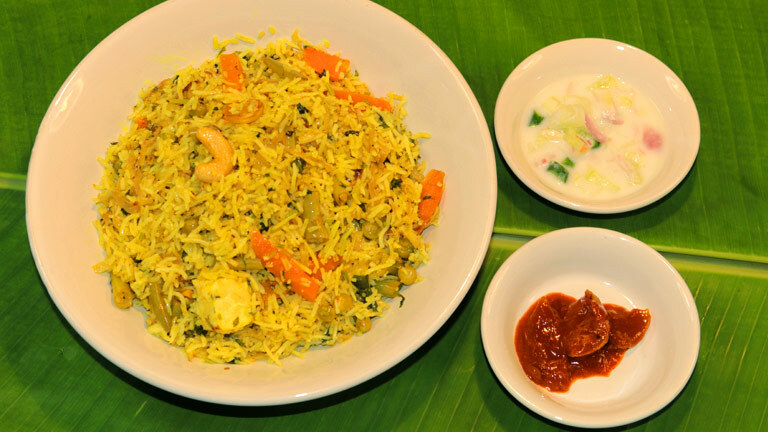 Salad and pickle are the best side dish for veg-biriyani.